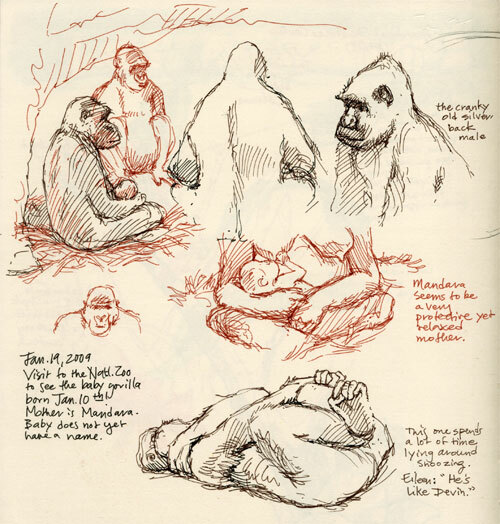 Last January my daughter and I took our nature sketchbooks to the zoo, where we saw and sketched the new baby gorilla, Kibibi (“little lady” in Swahili). Mandara, the mother, was quite patient, but it must be extremely tiring to have a constant stream of giggling, pointing visitors so soon after giving birth. We didn’t even take her a casserole. Kibibi is a year old today, and the zoo is planning a celebration. I wonder what happens at a gorilla birthday party.